Many injury firms take too many cases. Some have hundreds of current clients. If you are one of 200 clients, you might not be able to get your attorney’s full attention when you need it. In fact, your attorney might not even remember your name when you call. Because I believe that less is more, I limit the total number of clients I represent at any given time to between twenty to thirty. If I take your case, you are going to be one of a select few. You can rest assured that I will have the time to dedicate to knowing your case inside and out. It seems like some attorneys view client calls as a nuisance. And so they make it really complicated to actually speak to them. You get to know their secretary or paralegal better than the attorney. The attorney seems to always be hiding from you. Because I simply want to serve you, I need to know you. I need us to talk often in order to know you well. My advocacy grows more powerful as my knowledge of you as a person grows. Every single client I represent gets my cell number. You can text me if you want. You can email me. Or we can sit down and talk on a weekend. You have 24/7 access to your attorney. Conventional contingency fees cost injury clients between one-third and one-half of the amount recovered. Sometimes, due to the complexity of a legal matter, fees that high are justified. But some of the big injury firms in Atlanta charge clients 40% to handle a simple car accident claim that settles pre-suit! What is different with my firm? Two things make me a little unconventional. On car accident cases, my fees are limited to 30% if we settle before filing suit and 35% if the case goes into litigation. That means I bill at rates 10% less than the big firms. You can see my attorney fee contract here. At the end of each case, I evaluate the fairness of my legal fee. Sometimes the fee you and I agreed on at the beginning of the case turns out to be unfair to you. I may have anticipated more work than it actually took to win the case. You may have needs that I do not have. I lower my fee in those instances. I’m able to bill at rates that are lower than the big firms because I run a non-conventional law practice. I don’t have the overhead those firms have. My firm has no partner structure, I work mostly from home or in court, I don’t spend the fees I earn on TV commercials, and so I can make a good living while billing at lower rates. The bottom line? I get happy about putting more of the net recovery in my client’s pockets. Wondering how much it will cost you to hire an attorney? Concerned about hidden costs? I want you to know exactly what you will be paying before you hire me. You’ll notice that the client is being charged twenty cents per page for black and white copies! That’s twice what a copy store would charge. Notice also the client is also being charged for something described as “Database Charges”. This refers to scanning documents into the attorney’s case management software. Twenty cents per page to scan documents into the computer. Buyer beware! So what is different with me? I tell you what your costs are going to be as they come up – no hidden case expenses. I’ll consult with you before incurring significant costs. I will keep your costs as low as possible. I will treat like I want to be treated. I won’t try to make a profit off the costs. The heart of the contract you will sign to hire me is “no fee until you win.” I mean that quite literally. You only pay me after you win your case. Since I only get paid if you win, how motivated do you think I will be to work on your case? Extremely motivated! I don’t get paid unless you get paid. We are two peas in a pod, so to speak, with aligned interests and a mutual relationship. The better you do, the better I do. This kind of working relationship is a quantum leap improvement over traditional hourly legal fees. Not only do you owe me nothing unless you win, you pay nothing up front EVER. With a traditional attorney fee you pay your attorney up front and you won’t be getting a refund no matter how hard your attorney works (or doesn’t work). With a “No Fee Until You Win” attorney fee you don’t pay unless your attorney works hard and wins your case. I bill at rates 10% lower than the big injury firms. How big a difference will that make? To show you how big, consider what you will pay under a contingency fee contract offered by one of the large firms under a 40% fee arrangement. For example, let’s say your case recovery in a car accident is $20,000. 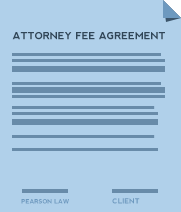 Under a 40% contingency fee contract, the attorney’s fee would be $8,000. If you had hired me, your fee would be limited to $6,000, putting an extra $2,000 in your pocket. Or, if your case settles for $40,000, you would recover $4,000 more with my firm than with one of the big firms. And if your case settles for $400,000, you would recover $40,000 more with my firm than with one of the big firms. 10% is a big difference. Why do I do it? How can I charge less? I’m able to bill at rates that are lower than the big firms because I run a non-conventional law practice. I don’t have the overhead those firms have. My firm has no partner structure, I work mostly from home or in court, I don’t spend the fees I earn on TV commercials, and so I can make a good living while billing at lower rates.